Hey Y'all! I love love love menswear! I also love black and white! Add a pop of color and that's all she wrote as far as my signature style is concerned. I often wear jackets, shirts with my hubby's ties and skirts with boots to work in the cooler months. I am very much into the "preppy" look. 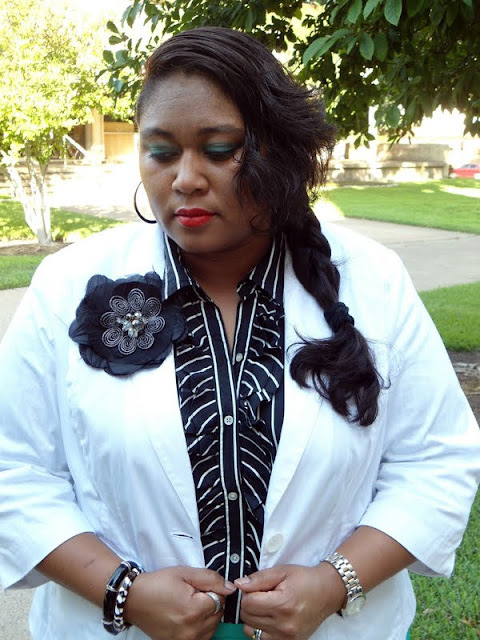 Today I wore some thrifted pants, white blazer from Lane Bryant, striped ruffle front silk blouse by Ralph Lauren and Steve Madden oxfords. Hope you like it! Thank you for all of your comments concerning my acne woes! I am still having forehead breakouts but the rest of my face seems to be clearing up. On another note...don't forget to follow me on Facebook and Twitter too! I love how you try different looks. You look great! I often try pairing men pieces in my fall outfits using hats and vests. I think it adds a little something something. Girl I am having acne on ONE cheek!! ONE!! Its annoying! You really know how to mix and match clothes and the result is always amazing. :) Those pants and that blazer are what I like the most here. I completely love this outfit! Especially the color of your pants! I love how you matched your shoes with your top! Haha. So cute! Oh Snap! You got on the oxfords! I bow down to you right now, especially in those pants! I love I love I love! I need your email mama! Twitter it to me! Your my main chica on blogger! Dont worry about the breakouts girl, you look beautiful no matter what. On the inside and the outs. Bumps cant take your fierceness away...trust and believe..lol! And no devil outfit for the boobooski...LOL! Kiah you worked this look!!! LOVE everything about it and the oxfords were so unexpected but makes me love this look even more! i love menswear inspired looks as well! you look awesome! Yay!!! I'm glad the acne is clearing up =) By the way you do the menswear the way I like to, like a lady =) Totally loving this look Kiah!!!! You never cease to surprise, amaze and inspire me, my dear Kiah. YOu are wonderful beyond words, and I am so lucky to have found you. another perfect combination! love love the black and white but the best part is the colored pants! what a fabulous idea to combine the black and white with color! the shoes are my favorite part!!! love, love, love that ruffle shirt! My dear Kiah, this look must be on the cover on a stylish magazine!! !YOU ARE AMAZING!! !Let me tell you that you have such a great sense of style! Love this look. 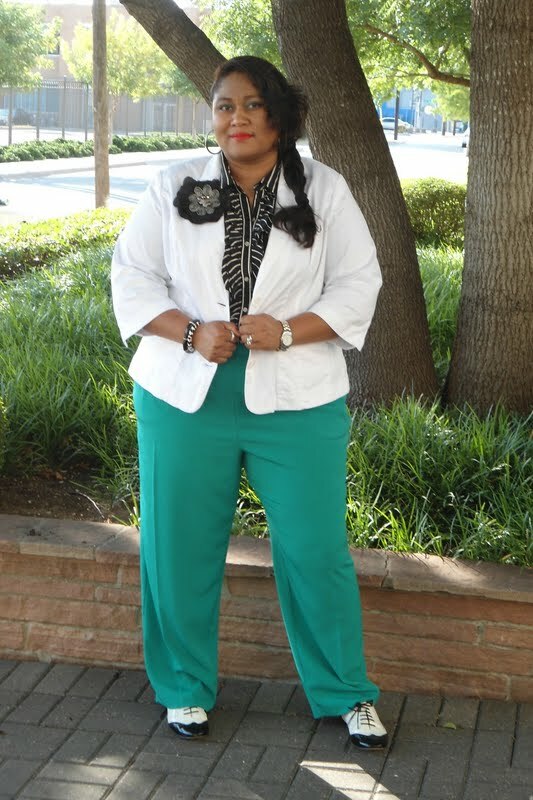 So chic and the color of the pants set off the whole outfit. Those spectator shoes are fierce. You look so chic girl! Love it! I love this outfit, and those oxfords are a must have.I am now following you. OMG…can I have those shoes…Love them! 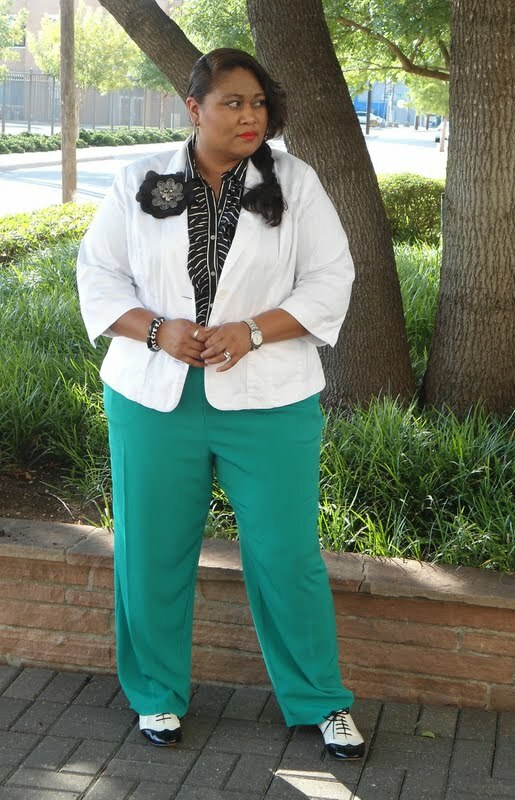 You are rockin this menswear look…fabulous! Beautiful close up! What color is on your eyes??? Those shoes are super fancy and I love them. Still hunting for some pants like these before the weather changes. Great post! I love Menswear sooo much, and love seeing other bloggers wear them! You look smashing. Those wingtips are super awesome! Your shoes rock! Has that 20s feel to it. Lovelovelove. Love the green and white! Love this! I bought some shoes similar to these over the summer but havent been able to figure out what to wear them with. Thanks for the inspiration!